witness | Scuffalong: Genealogy. witness – Scuffalong: Genealogy. On 12 March 1949, Freeman Farmer, 22, son of Tom and Anne Bynum Farmer, married Lunia Cannady, 21, daughter of Albert and Sylvan Andrews Cannady, on Lepton [Lipscomb] Road in Wilson. Original Free Will Baptist minister George W. Little performed the ceremony in the presence of Jeraline Edwards, E.N.C. San. C.D. ; my grandmother Hattie Henderson, 1109 Queen Street; and Bessie Simmons, 211 Stantonsburg Street. Each of these women worked at Eastern North Carolina Sanatorium and, presumably, so did Lunia Cannady Farmer. On 21 February 1903, pedestrians bustling about the streets of downtown Raleigh on a waning Saturday afternoon gazed in horror at a bleeding body crumpled in the middle of Fayetteville Street. Ernest Haywood, son of a prominent lawyer, had shot Ludlow Skinner, son of a well-known Baptist minister and “quiet and gentle as a woman,” in cold blood. (For the messy backstory, see here.) The crime, widely reported in newspapers across the state, captivated the public. 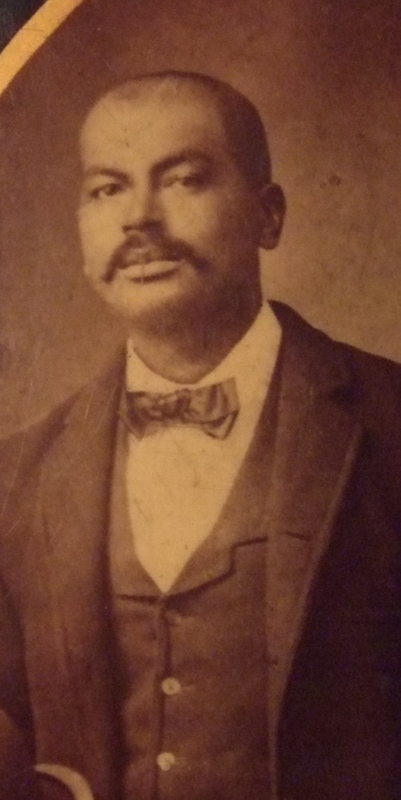 Ned Barnes (1869-1912), son of Willis and Cherry Battle Barnes and brother of my great-grandmother Rachel B. Taylor, found himself thrust into the center of the months-long criminal court proceedings as the State’s star witness. Only recently arrived in the capital, Ned was a drayman for the State Hospital, a ground-breaking psychiatric facility located just west of the city center. His duties that afternoon took him to the post office — and the very edge of the drama. Despite his evident efforts to stay out of white men’s business, he was drawn straight into the vortex. 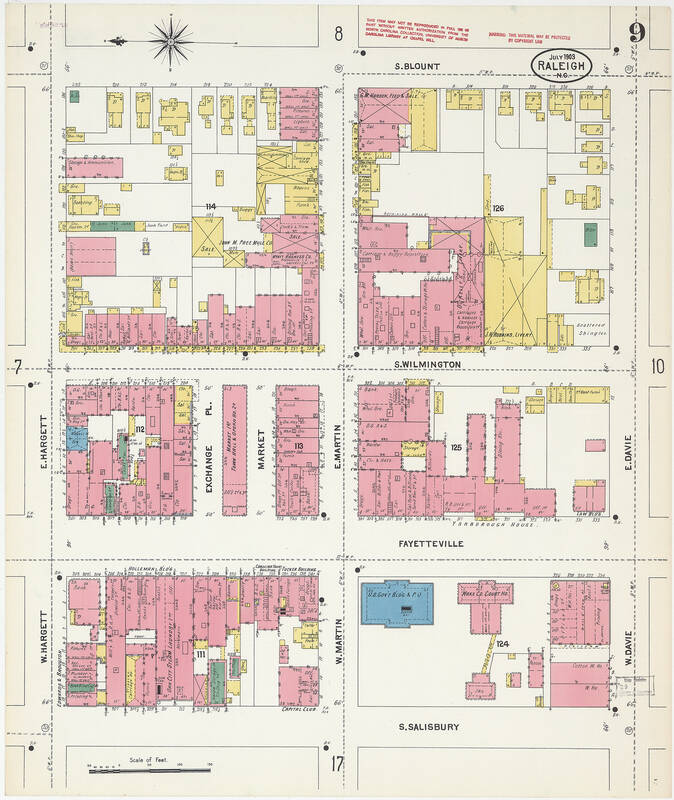 Sanborn Map of Raleigh, July 1903. The Post Office is the large blue building at lower right. On 30 May 1903, the Raleigh Morning Post published Ned’s habeas corpus hearing testimony in its entirety. This serious matter required that the paper forgo the mocking dialect so often attributed to African-Americans of the era — regardless of their actual speech — and the transcript reveals an ideal witness, straightforward, economical, willing to admit what he did not see. Ned’s language is respectful, but not obsequious. He does not take obsessive care with his “yes, sir” and “no, sir.” He answers only the question put before him and takes pains to deliver accuracy. Q: Ned, where did you live before you came to Raleigh? Q: How long have you been in Raleigh? A: About two years and a half. Q: What is your business now? A: Driving for the state hospital. Q: Have you been in the employment of this institution since you came to Raleigh? Q: Where were you on the afternoon of the difficulty between Messrs. Haywood and Skinner? A: I was in the city here. Q: Did you see it? Q: Tell about it in your own way. What you saw. A: I had been up to the market taking some ladies to the market house and about four o’clock I started down to the post office to wait for the mail before going back. I drove down below the south end of the post office and turned my horse around. I placed the robe on this side and heard some one speak. I stood my carriage just above the north side of the steps near to the curbing. I saw Mr. Skinner strike Mr. Haywood on the right side of the face. Q: How far away were you from them, just the width of the curbing? A: Yes sir, right by the edge of the sidewalk, about 12 or 15 steps I reckon. Q: Do you mean steps? A: Yes sir, steps. It is wide across there. Q: You mean just the width of the sidewalk from the little projection? Q: Did you hear what was said when you turned your carriage there? Q: Just as you turned your head you saw the blow? Q: What became of Mr. Haywood when stricken that way? A: He staggered back against the curb which leads out from the post office and fell on his left hand, but recovered and went for his pistol and Mr. Skinner jumped back from him and raised his right hand in this position, and stopped and Mr. Haywood raised up and fired at him and Mr. Skinner wheeled and I never saw him any more. Q: Was Mr. Skinner’s back to you on his side after he struck Mr. Haywood? A: He seemed sideways to me. Q: Which side was to you? A: His right side was to me I think. Q: Which side was towards Mr. Haywood? Q: You saw his left hand? A: No sir, his right hand. Q: He struck so that Mr. Haywood fell? Q: Did he raise his hand? Q: In that position Mr. Haywood fired the first shot? Q: He was standing this way? Q: How far away was Mr. Skinner from him when he fired the first shot? A: About half way across the sidewalk. Q: What did Mr. Skinner do when the first shot was fired? A: He wheeled to go. A: He wheeled this way and turned to go. Q: After he turned to go what did he do, continue or stop? A: I don’t know whether he stopped or not. I did not see him until I looked on my right hand side. Q: You stayed in the carriage? Q: Why did you not see him after he turned to go? A: He got behind my carriage. Q: Which way was your horse’s face turned? A: North towards the capitol. Q: You say Mr. Skinner went behind your carriage? Q: Did you turn the carriage? Q: Where was he then? A: He was in front of me going to the street car track. Q: What did he do when the second shot was fired? A: I did not see him, I was looking at Mr. Haywood. Q: Was he off the sidewalk when the second shot was fired? A: I don’t know I was looking at the man that had the pistol. Q: Was it after the first or second shot that Mr. Skinner turned to go? A: After the second shot. Q: How far from the curbing was he? A: About half way distant. Q: That was after the second shot? Q: What part of him was at that time presented to Mr. Haywood? A: His back was to him. Q: After he got into the street? Q: Did you look at Mr. Skinner after he got into the street until he fell? Q: How did he go? A: He crossed over the track then turned to his left and got to the low edge of the track and fell face first to the pavement. Q: What became of Mr. Haywood? A: He walked off the corner going to the Tucker building. Q: Did you notice whether Mr. Haywood had his hat on? A: He had it on when he passed from the sidewalk. Q: At the time of the shooting, did he have it on then? A: Yes sir, he got it on then. Q: What do you mean by that, he got it on then? A: It was knocked pretty near off and he gathered it up. Q: Did you tell anybody about this occurrence? Q: How long was it before you told about it? A: I did not make any atatement till I got to the asylum. Then I told Dr. Koy. Q: Do you remember what you told him? A: I told him I saw Mr. Skinner strike Mr. Haywood and I saw Mr. Haywood shoot him, and he didn’t ask me anything else. Q: Did you tell any one else in town? A: I told some one else, I don’t know who – this feller that runs the bar room, what is his name? Q: Which bar do you mean? Q: You have told him since? A: Yes sir, I told him. Q: You did not tell him all the facts? A: And I told another man, I don’t know who it is. I have seen him here. Q: Was it Mr. Rogers? A: No sir, it was a white man. Q: What white man did you tell in town? A: I don’t know his name, McDaniels or McDonald, I think. Q: Where does he live? Q: What is his business? A: I don’t know, I see him around the Tucker building. Q: Did you tell him you saw it? A: He asked me what did you see, and I told him I did not care to make a statement. He said, “did you see Haywood shoot,” and I told him yes. I did not tell him anything else. Q: Which Rogers did you tell? A: He works in the Commercial building. Q: What sort of a carriage did you have? A: It was not exactly a carriage but was a one horse surrey. Q: Did it have curtains on. A: It had black curtains on. Q: Were the side curtains off? Q: It was open except the back. A: The front curtain was off I mean. Q: It had the back curtain on. A: The back curtain and the two back curtains. Q: Just the width of the seat was closed? Q: All the others were open? Q: Where did your carriage enter Fayetteville street? A: I came from the market to the post office. Q: There you turned around? Q: How far did you come up the street before turning around? A: Just to the end of the post office, up near the sidewalk, near the south steps. Q: Did you turn your surrey towards the door of the court house? Q: Your horse’s head was where? Q: Where did you stop your horse? A: Right there where I was. Q: And where were you? A: Sitting in the carriage. Q: And where was the carriage? A: Standing on the street. Q: Near what part of the sidewalk? A: Right at the edge of the sidewalk. Q: Where was the location? Where was the horse standing? A: Pretty near the post office building. Q: Pretty near the front? Q: Near what part of the front? A: The lower end of the south door. Q: Where was the head of your horse? A: Just above the lower steps of the post office. Q: Just above the south steps? Q: So you had your back to the post office? Q: What first attracted your attention there? A: I heard some one speak. Q: Whom did you hear speak? A: I don’t know which one, one of these men, I don’t know which one. Q: Did you know Mr. Skinner? A: I did not know him sir. Q: Did you see him pass out of the post office building by your carriage? The trial in State vs. Haywood unfolded in early fall. The first two weeks of October, crowds thronged the courthouse, the newspapermen among them jostling for prime spots to cover the action. Ned Barnes and other reprised their roles as witnesses, and a surprising verdict was rendered: Not Guilty. No doubt relieved to move out of the glare of the spotlights trained on this notorious event, Ned returned to real life — his wife Louisa Gay Barnes; young children, Mattie (1895), Alice (1897), Ned Jr. (1900) and Howard (1902), and later Blonnie (1908) and Jerrel (1909); and work as a coachman. By 1910, however, he had given up driving, and the censustaker recorded his occupation as a porter at a club. Though a relatively young man, it is likely that his health had already begun to fail him. On the first day of December 1912, Ned Barnes drew a last breath and was released from the agony of acute uremia. He was 42 years old. Photo courtesy of Katie C. Barnes.